This is Part 15 of my continuing coverage of the legal plight of Bruce Aristeo of Camden, New Jersey that began with a relationship breakup and civil dispute with Jody Raines and subsequently escalated to the Camden County (NJ) Prosecutor’s Office. His trial begins in January 11, 2016. My friend April Brown, Author of “Poetic Justice”, and I have had a few conversations regarding the Jody Raines – Camden County Prosecutors vs. Bruce Aristeo Legal Saga. She has been reading each and every post since I began last month with interest and shock. I am happy to say that she is not alone in following this story. There is private email chatter and visitor traffic to Defiantly continues to gradually increase as I post and Tweet out more information, documents, and commentary regarding Bruce Aristeo. April Brown is a well-respected charity auctioneer and businesswoman from Seattle and also operates a non-profit cat shelter, Whisker City. She is an activist on a number of causes. She is best known nationally as an outspoken advocate against Linda Ellis’ “Dash Poem” Copyright Extortion Scheme. In fact, she has the distinction of publishing the first book on copyright extortion on Amazon.com. 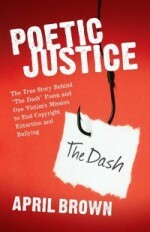 She donates her times to assist and educate “Dash Poem” victims nationwide. More recently, April follows First Amendment and especially Internet free speech matters. As a successful businesswoman, she respects the First Amendment and and individuals right to free speech. In recent years, April has become informed of how restraining orders can be wrongfully used against someone. However, like me, she has not seen a case up close that has been escalated to criminal prosecution and certainly not one as egregious as Bruce Aristeo’s case where he was incarcerated for six months. April made a point to tell me that, as a woman, she feels Jody Raines has greatly abused the process and makes women look bad because it conveys that she is so weak that she had to push the criminal justice system to prosecute someone over “hurt feelings” over some YouTube videos. April also believes that Tracy Cogan isn’t doing herself any favors for her professional reputation either in pursuing the Aristeo case. It is likely to come back to bite her and hurt her professional reputation. It makes her and the Camden County Prosecutors Office look like schmucks (my word, not April’s). April viewed all of Bruce’s so-called “inflammatory” YouTube videos that I shared online. She said there was nothing remotely “threatening” about those YouTube videos. In fact, like me, she found some of Bruce’s videos humorous. Bruce is clearly intelligent, articulate, and has a wry sense of humor. However, in Camden, NJ someone having “hurt or distressed feelings” (once a restraining order is in place) is apparently enough to get someone arrested and prosecuted. April commented to me that she kept looking for the “crime” Bruce committed that was “deserving” of criminal prosecution. I told her I also tried early on but could not find any “crime” whatsoever. Just someone getting judicially fucked over because of humorous YouTube commentary videos and living within 10-miles of the corrupt hellhole city of Camden, New Jersey (population 77,000). I bring April into the Defiantly conversation because gives a woman’s perspective and was a police officer herself many years ago. April absolutely dislikes it when women act weak, play to their weaknesses, and abuses the legal and judicial system as Jody Raines appears to have done against Bruce. Of course, April and I agree that the Camden County Assistant Prosecutor Tracy Cogan appears to be abusing her prosecutorial powers. April has offered comments to me both publicly and privately. She has given me permission to share her comments publicly regarding Bruce’s legal plight with others. I have done my best to represent her opinions accurately. If I get it wrong, April will certainly correct me and I am happy to make changes so that it correctly reflects her opinions. Going forward, I will periodically post her comments and remarks as an additional voice in support of Bruce Aristeo.